Call Us (678) 434-2000 and join the Phenix Family today! Construction on the newest Phenix Salon Suites began on July 27th. Based on our current schedule, the first salon professionals will be moving into their new suites in October! These suites are designed primarily for licensed Cosmetologists and Master Cosmetologists. However, they are also perfectly suited for licensed Estheticians, makeup artists, massage therapists and other health and beauty professionals. Contact us right away to see the large variety of suite sizes and shapes that we have designed, all with you, the salon professional, in mind. All suites include beautiful new salon equipment, individual thermostats, warm, natural lighting and heavily insulated walls to provide the private space that your clients crave. Rental agreements are month-to-month and all rental rates include your water and electric utilities, free laundry and free WiFi. 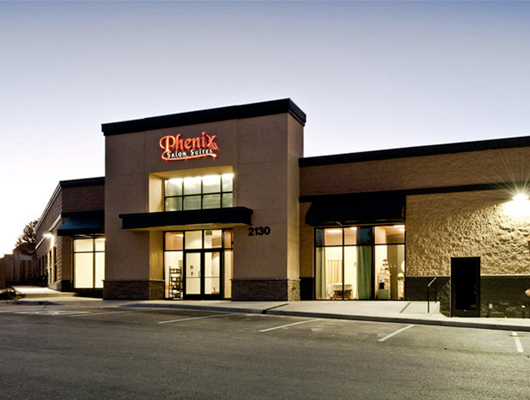 Phenix Salon Suites of Peachtree Corners is locally owned and operated. We are committed to building a community of beauty and health professionals who know that success is about more than just keeping that appointment book full. It’s also about loving what you spend so many hours doing and loving where you do it. And being around others who believe it, too.